Antibiotics are lifesaving but have significant negative health consequences, reducing populations of beneficial gut flora along with the pathogenic microbes they are prescribed to target. This side effect can be hedged while on a course of antibiotics, and restorative strategies can be employed to more quickly repopulate native gut flora. “Human microbiome” is the term used to describe the inner (gut) and outer (skin) ecology of beneficial and commensal bacteria, yeast, and viruses. Their collective populations within the microbiome number in the trillions and contain 100 times more genes than our own human genome, exerting a staggering influence on overall health. Research has revealed that the human microbiome comprises up to 70 percent of the immune system, contributes to the regulation of hormones (particularly estrogen, implicating antibiotic use with increased incidence of breast cancer), and assists in the breakdown of environmental toxins. We start off with limited exposure to microbes in the womb in the womb and become significantly inoculated by our mother’s flora in the birth canal just prior to our appearance in the world. Like a fingerprint, these species of microbes will populate our guts for the remainder of our lives unless we have repeated contact with antibiotic substances, including antibiotic drugs and certain chemicals such as glyphosate, the active ingredient in the herbicide Roundup. Antibiotics shift the balance of gut flora toward pathogenic species, particularly strains of yeast that are unaffected by antibiotics. In addition, patients are rarely educated about taking probiotics or eating probiotic-rich foods while on these drugs. Depending on the potency of the antibiotic and duration of use, the damaging effects on the human microbiome may be negligible to severe. To minimize risk, probiotics containing beneficial bacteria and yeast can provide key immunological and metabolic support during and after a course of antibiotics. 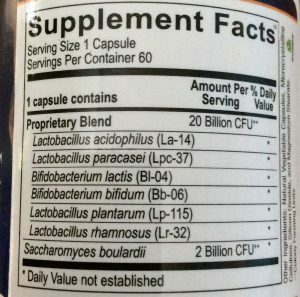 Probiotic supplements are designed with research-supported strains of microbes to elicit specific benefits that are species dependent, such as Lactobacillus plantarum that can suppress growth of Clostridium difficile. Probiotic-rich foods such as yogurt and kefir either have dominant strains that constitute the starting mother culture or a diversity of wild bacteria and yeasts, as in homemade sauerkraut. The key to using these supplements and foods while on antibiotics is to space them as far between antibiotic doses as possible. This will provide a brief window of benefit until the next dose exerts its antimicrobial influence. In most cases, antibiotics are prescribed twice a day, approximately 12 hours apart. If you are therefore taking the antibiotics morning and evening, then a probiotic supplement would best be taken at midday and with lunch, as food helps deliver probiotic microbes into the gut. Probiotic-rich foods can be consumed liberally with all meals to provide additional support. The exception to spacing probiotics apart from antibiotics are beneficial yeasts such as Saccharomyces boulardii, commercially available as one element of a probiotic blend or as a stand-alone supplement. As a yeast, S. boulardii is unaffected by antibiotics and can be taken at the same time, helping prevent pathogenic strains of yeast such as Candida albicans from growing while the body is compromised. Pathogenic microbes are always present in our gut and only become opportunistic infections when the balance is affected in a manner conducive to their growth. There are different protocols, but I recommend a minimum of 2 billion colony-forming units (CFUs) of S. boulardii, taken at the same time as antibiotics, and at least 20 billion CFUs of a diverse bacterial-based probiotic, taken as far apart as possible from the antibiotics. Both should be taken during the course of antibiotics and for at least 30 days afterward. At best, this strategy will help prevent significant fallout from antibiotic use, such as chronic diarrhea or a yeast infection; however, some degree of imperceptible damage is still likely occurring. Side effects can be mitigated through long-term consumption of fermented food and prebiotics. Fermented foods and probiotic pills supplement the microbiome. These species generally don’t repopulate our gut; rather, they act as transients, exerting their beneficial influence before exiting the body. Thus, probiotic-rich foods are best consumed on a regular basis, preferably daily, and as frequent as with every meal for a patient with a history of gut problems. For those who do not care for raw fermented foods, probiotic supplements can be taken daily and in a pulsed manner, occasionally switching strains (as per your health care practitioner’s recommendation) to take advantage of the myriad benefits of microbial diversity. If probiotics are your good gut bugs, prebiotics are their ideal fuel source. Fiber-rich plants, especially vegetables and whole grains, nourish a healthy and diverse gut ecosystem. Prebiotic-rich foods or supplements (such as inulin) restore native gut flora, gradually reclaiming the balance upset by antibiotics and restoring metabolic and immunological resilience. Sometimes antibiotics can’t be avoided. But we can do our best to curb negative effects and reinforce the naturally diverse and beneficial human microbiome by employing a strategy encompassing thoughtfully timed probiotics and prebiotics from supplements and foods.